Earlier this year we had a customer with an upcoming wedding, even though the wedding was not at their home. The mother of the bride wanted the house to look its best for photos. The owner of the house had already engaged a landscape gardening company to install some instant turf and some new plants in the garden beds. 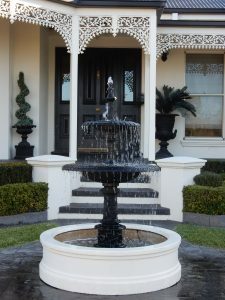 She also decided that a new water feature and a garden light would finish off the project nicely. So Click Control Systems attended before the landscaper to install some power and control wiring for the garden light and the water feature. We then returned after the turf was laid to concrete a footing in for the garden light. And returning for a final visit to install the garden light and connect and assemble the water feature. The garden now looks magnificent in either the day or the night and the soothing ambiance of the water feature just adds to the appeal of this garden makeover.